This extraordinary collection of essays was presented to the Tübingen theologian Eberhard Jüngel on his 70th birthday. For the past four decades, Jüngel has distinguished himself as one of the world’s leading dogmatic theologians, and as the most brilliant and creative of all Karl Barth’s pupils. In their foreword, the editors offer a succinct and acute summary of the central themes of Jüngel’s theology. More than any other theologian, Jüngel “placed God’s advent at the centre of his thought. Since God comes, we must speak of him and we can think him. Without God’s advent, there would be no faith, the Christian would have nothing to say, and Christian theology could not think any truth” (p. ix). Although God comes always “from himself, to himself and through himself,” he nevertheless comes “to the world and to humans.” Indeed, God comes “as the mystery of the world by showing himself as the human God” (p. x). And this coming of God as the world’s mystery is by no means a “worldly necessity” – on the contrary, it is “more than necessary.” God’s coming “does not follow from any conditions inherent in the world, nor does it fulfil any preceding human needs” (p. x). In other words, God is neither merely possible nor necessary for the world – instead, he is actual, since he freely comes to the world. And because God comes to the world again and again, “we must always speak of him further, and we can never be done with thinking of him” (p. xi). This has always been Jüngel’s central concern – to engage in the difficult business of thinking God; to think God as the coming one, the one who relates to the world in sheer freedom and actuality, and therefore the one of whom we can truly speak. In honour of Jüngel, the editors have thus gathered a massive collection of 32 new essays, all centred on the theme of “God and the thinking of God” – since this is the central theme both of all theology and of Jüngel’s entire career (p. xii). The list of contributors reads like a Who’s Who of contemporary academic theology: there are biblical scholars like Martin Hengel and Rudolf Smend; ecumenical theologians like Kasper, Küng and Lehmann; German dogmaticians like Pannenberg, Moltmann, Dalferth, Krötke and Rendtorff; as well as three leading Anglo-American theologians: David Ford, Bruce McCormack and John Webster (whose essays are written in English). The papers collected here span several disciplines – Old and New Testament, church history, philosophy, dogmatics, practical theology, hermeneutics, world religions – but they are united by their focus on “God and the thinking of God.” Moreover, alongside the most rigorous forms of academic theology, there are essays here on preaching (together with a sermon by Rudolf Smend). This is especially fitting, since much of Jüngel’s thought has turned around the concrete situation of preaching. 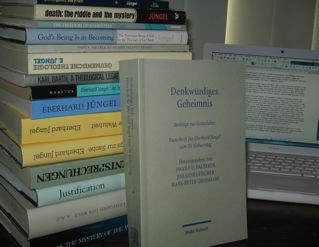 And while it is customary for German theologians to cap off their careers with a multi-volume work of dogmatics, it’s no accident that Jüngel’s career has culminated in several volumes of sermons – sermons which demonstrate vividly Jüngel’s underlying conviction that the God of advent truly “comes to speech” (i.e. becomes an actual event in our world) in the gospel of Jesus Christ. In sum, this volume is not only a superb tribute to one of our greatest living thinkers; it is also a profound and important contribution in its own right to contemporary reflection on the doctrine of God.